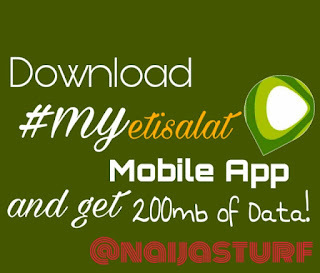 ETISALAT NG vowed to reward any of their subscribers with 200mb of data once they download their self-care mobile application named "Etisalat EasyMobile App" (My9mobile App), I know many people will think it's a cheat, well, this is another way of latest free browsing on Etisalat, it was officially posted on the etisalat's facebook fans page on Friday at about 12:59pm and it's a normal data just as those we used to buy with our money and it has no limitations of using it. I think they trying to use this method to get huge numbers of downloads count on the play-store by giving out the Etisalat 200mb just to lure their subscribers to download. But trust me, naija we no dey see awoof go despite the fact that they said awoof de burst belle 😂! However, apart from the free 200MB stuff the app has its own side benefit which can get so many tasks done easily for all etisalat subscribers, let's find out what to do and how we can use this app below. And can even lock your line if it gets stolen & much more. all you need to do is just tap. 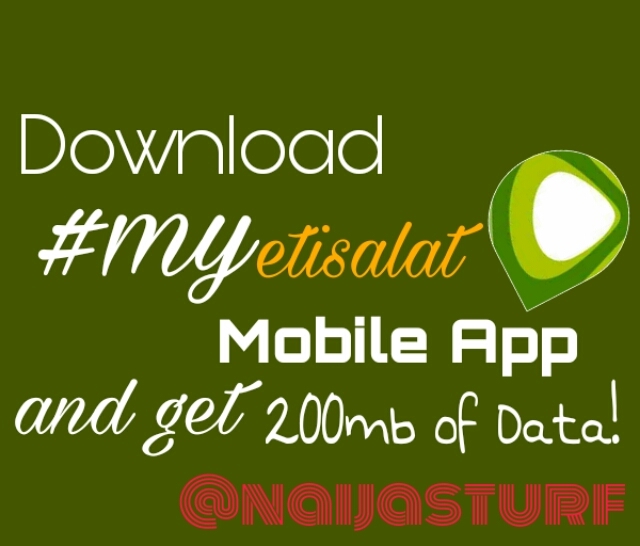 If you are Etisalat NG user or subscribers, here are some tips for you to follow and enjoy this offer from Etisalat, at first what you need to do is to download the "Etisalat Mobile App" from Play Store, upon successful installation tab on the register button to activate, Once it's successfully completed then wait for your data's welcome message from etisalat. NOTE: You may not instantly be given if you Trying to activate it during the weekend period but hopefully you will get it on Monday. All the etisalat subscribers are entitled to this gift if she, he, me and you downloaded the app and followed as prompted on the app. Don't forget to share with your friends and love once. Nice One, Keep it moving.